This little toy would be perfect for any kid or adult that is tired of the same old toy trains. 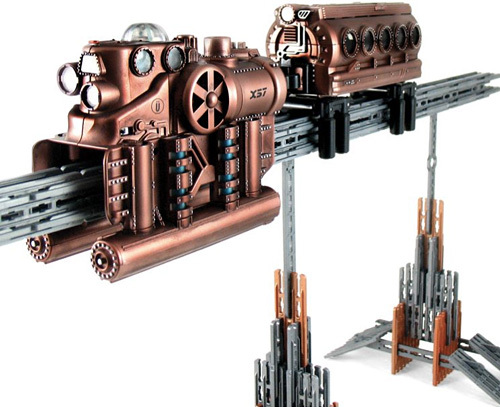 Not only does this one have that steampunk feel that has become so popular, but it gives things an interesting edge by being a monorail. It’s still pretty much the same as navigating a toy train, but the look of this one is a whole lot more fun. This 550 piece set has all sorts of straightforward instructions to help kids figure out to construct all of those little pieces. The passenger car has all sorts of cogs, portholes, rivets and visible gears. The track can run as far as 20 looping fee over a 25′ sq area. The set comes with traction tape that’ll allow for the cars to climb up 30 degree grades. The Victorian Futurist’s Monorail is intended for kids 8 and up. It’ll require 4 AA batteries. You can purchase the set for $159.95 through Hammacher Schlemmer. Bought one! Love it! Track assembly is up to you, but the one shown, from the instructions, works fine! the passenger car has a great ceiling light in it! The engine runs just fine! Set comes with a strip of anti-skid tape for those hard climbs! I have not used it yet! Shop Ebay for one and you may be greatly surprised! These show up sometimes under a hundred bucks!! Big, long box, lots of stuff! Caution demanded in shipping rates! Again, well done Uberstix! Great Monorail!!!! !